Choose the package wich suits you the most! Which experience suits you the most? The first indoor skydive session is a wrap! Full of excitement and adrenaline your feet get back on the ground, and you’ll probably want to fly again. That’s the reason why we only provide you packages with two flights or more. The two sessions you’ll probably need to experience the reaction of your body on the power of the wind. After three or four sessions the instructor learn you to get more control and stability to skydive more independent. After five or six sessions you’ll notice you will get the control and stability and earn the indoor skydive certificate for flying all by yourselve. That’s why the five indoor skydiving sessions package is rated as best choice by our guests. Have a look at our packages and experience it yourselve! Save €5,- p.p. with a online booking! Are you ready to fly? The adrenalin boost you get from indoor skydiving is unprecedented! At Indoor Skydive Roosendaal you will undergo the ultimate free fall experience, without jumping out of an aircraft. You will glide on the power of the wind! And that gives you a kick!! 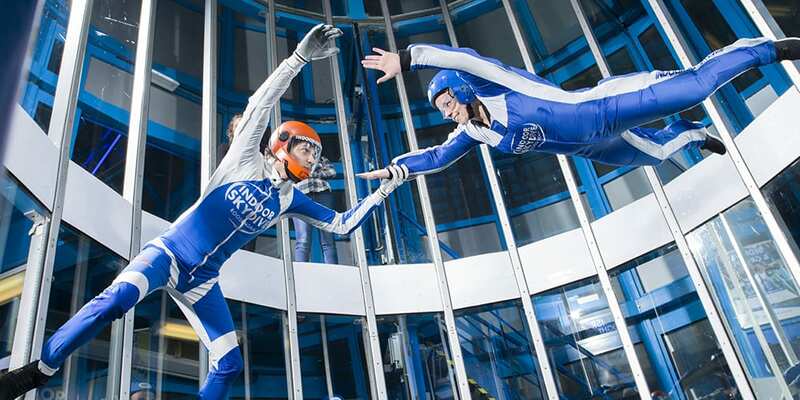 You do indoor skydiving in at least 60 seconds per session, starting with two sessions. You at least need this to find the right skydiving position. The more skydive sessions you book, the greater the kick will be. Because after a number of sessions you’ve got the taste for it, and you can go a step further: skydiving indoors completely independently, without a supervisor. All prices are per person. Will you be coming to skydive indoors with a group, or with colleagues as a company excursion? Then look for the special prices on the pages for groups or companies. The prices for indoor skydiving sessions vary depending on the time that you come to skydive indoors. In off-peak periods the price per indoor skydiving session is lower than when skydiving indoors during peak periods. If you have any questions, please contact us! Book your indoor skydiving sessions now for an unforgettable experience!